The first single from the best of album will be "Karma Boomerang". This single will be released to the radio and be available for download from 13 April 2007. Two different versions of the promo single exist. The first is white with track information printed in black and Savoy logo. It doesn't come with a sleeve. A second version of the promo CD was produced which features a different mix of the song and is the version which is available for download. It comes in a picture sleeve which features a picture of a large money jar sitting on the bar of a cafe. The words "Karma Boomerang" have been hand written on a label on the jar. 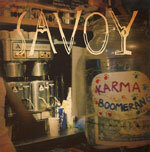 The Savoy logo is printed in large cream letters at the top of the sleeve. The back sleeve is brown with a lighter shade in the centre. The song title is printed in large black letters with track information underneath. The disc is black with the Savoy logo in large white letters across the centre. The title and track information are printed in white underneath.